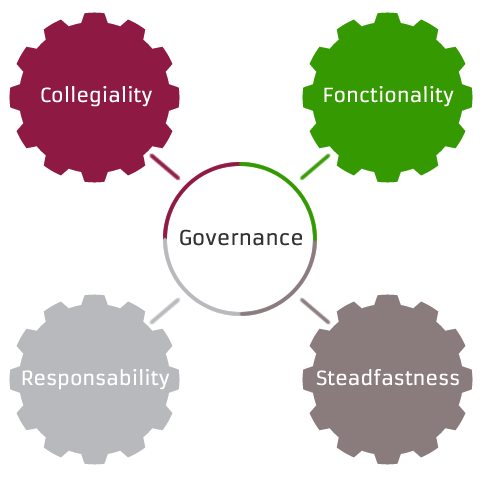 As a matter of principles the project governance follows four basic guidelines: collegiality, functionality, responsibility and steadfastness. Collegiality is the usual hidden face of scientific work. It requires that the scientific endeavour not be founded on competition between researchers, but rather on mutual support. Two main courses of action are intended to meet this objective: systematic meetings will be organized to foster interaction between the various project components; and researchers, partners and students will each participate in a many research hubs. These strategies will promote mutual knowledge among researchers and ongoing collaboration between the project partners. Our concerns also focused on functionality. Previous experiences in other large teams have shown two things: overly large research groups favored researchers’ disengagement (the free rider phenomenon); and projects based on overly customized individual searches do not promote collective work. That is why we chose the collaborative research hubs model. For each research area, the hubs bring together two to four researchers and two to four partners. That configuration was judged to be the ideal and most functional one both for applied research (in particular the 15 pilot projects) and for fundamental research (five common projects). That organizational pattern will also foster the contributors' responsibility. Each hub is headed by a hub director, accountable to the team for the work progress and the collaboration between the researchers, partners and students. Steadfastness is the last of our governance principles. Researchers’ and partners’ gradual disengagement from the project objectives is one of the greatest challenges that research projects conducted over many years have to meet. ADAJ’s work facilitation relies on very tight meeting schedules ensuring team participation and cohesiveness throughout the six year duration of the project implementation. 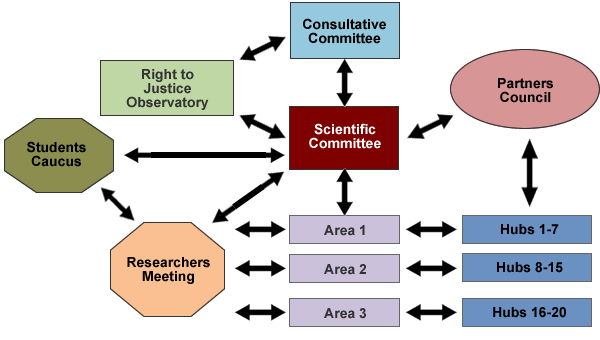 Organizational structure wise, ADAJ’s governance and scientific facilitation are based on a system bringing the various project components to connect with one another (chart 2). The coordination of the whole project is ensured by the Scientific Committee; it meets on a monthly basis and is made up of five researchers coming from various universities, academic disciplines and methodological horizons (chart 4). Responsibilities are shared among the Scientific Committee members according to the project structure: research areas, and students and partners coordination. The vital function of coordinating the hub teams is being performed by research area directors The Committee includes also a representative of the partners, a student representative and a representative of the public. The Scientific Committee must make sure that the work of each hub is launched under the most favorable theoretical and empirical circumstances and that it is underpinned by a solid and realistic partners collaboration. P. Noreau Montreal-U/TD> Law+Pol.Sc. Quanti+Quali (tative) Scientific Dir. The presence and ongoing engagement in the project of the legal sphere actors and of the citizens’ representatives are ensured through the Partners Council; it meets twice a year. Every year, during the annual symposium, the Partners Council members nominate a representative to the Scientific Committee. The Partners Council function consists in accompanying the Scientific Committee in its relationships with the legal system actors, and for developing a real collaboration between the spheres of practice and the academic communities. The Partners Council members could also suggest creating other research hubs, beginning with year 3, on the basis of available resources. The project envisions forming a Students Caucus that will bring together all the students engaged in the project. Every year the Caucus will nominate a representative to the Scientific Committee. It will meet twice a year. ADAJ intends to develop the next generation of researchers. Every year, one to four training workshops will be organized on writing methods and on work management methods (chart 5). The workshops will also provide opportunities for the Scientific Committee members and the students to connect and share with one another, and also opportunities to meet on an individual basis with scholarship recipients and research assistants. The Right to Justice Observatory, attached to Université de Montréal, has given birth to the ADAJ project and supported its development since the beginning. The Observatory is a permanent mechanism established in 2005, made up of researchers, practitioners and judges. It holds monthly meetings. The Observatory has largely contributed to secure private funding for the project. With support from the Consultative Committee, the Observatory will strive to diversify the resources required for the progress and viability of the project, identifying wherefrom could come the resources that would ensure the project development and sustainability after year 6. A Consultative Committee consisting of four researchers – one from Ontario, one from the USA and two from Europe - will be formed and hold remote or in-person meetings three times a year or as needed by the Scientific Committee. The Consultative Committee will have a “mirror” function: it will compare the observations drawn from the project with data derived from equivalent experiences realized elsewhere in Canada or in other countries. The Committee will also be tasked with reflecting on the transfer of the team findings to other jurisdictions and on the conditions best facilitating comparative research at every possible opportunity. For the same reason the Consultative Committee members will provide support to the Scientific Committee in mobilizing the gradual participation of other partners whether Canadian or foreign. Each hub team, in keeping with the steadfastness principle, will meet at least six times a year. Within each research area, two wrap-up meetings will be held every year. Finally, a two-day large wrap-up symposium, will be organized every year and open to the public.